Debora Crichton's philosophy is that "handbags should be fun, distinctive, and reflect YOU. After all, why carry a handbag that everyone else has?" Using images licensed from prominent artists and photographers, Debora's studio in Connecticut matches them with beautiful hard bag shapes and covers with clear resin, ribbon border. She also offers smaller accessories with the same artwork. Please read more details about interior, features and care below. Bag measures 9 x 2 inches at the base, 3-7/8 inches tall. Opens from hinged bottom. Chrome frame hardware, with the hard body covered in black silk dupioni fabric. Interior is undivided/open with one small elastic pocket Top clasp is studded with clear rhinestones. Artwork on each side is from different Fra Angelico paintings, an Italian Renaissance painter of religious themes, this bag is rich in warm golden colors. 6 x 3-1/2 inch soft black leather trifold wallet has artwork sealed and mounted on top. Inside is a full-length and deep paperwork/receipts slot. There are 11 card slots plus photo ID slot, and open slots behind each of the 3 partitions. Closes with snap. On the outside is also zipper coin purse. A typical Art Bag has black satin lined interior, divided by a center zip compartment. Small open pocket on one side wall. 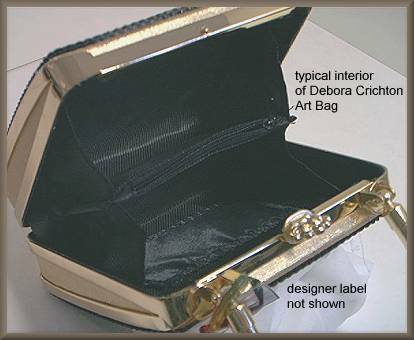 The inside label is "ART BAGS by Debora Crichton" unless otherwise noted. The bag comes with a detachable 46 inch fancy shoulder chain in metal color to match the frame. Also comes with no-label dust bag. These bags are finished by hand with resin coating over artwork and framed by ribbon, and thus the area on and around art/ribbon may show minor imperfections. CARE...Do not leave your handbag in the sun for long periods of time...then ENJOY! Business/credit card case in elegrant brushed aluminum finish. Top has sealed artwork. 3-5/8 x 2-3/8 x 1/4 inches. Read about what others think of Debora Art bags and accessories! Instead of reviews for a specific product, this is a place to share about the designer line in general.